"A delicious dish inspired by eggs Benedict with mozzarella, tomatoes, and pesto." To assemble, place a poached egg on top of each English muffin. Spoon a teaspoon of pesto sauce onto each egg and sprinkle with salt to taste. I just used this recipe for the correct technique for poaching an egg and it worked perfectly! I poached 2 eggs beautifully the first time I've ever tried. 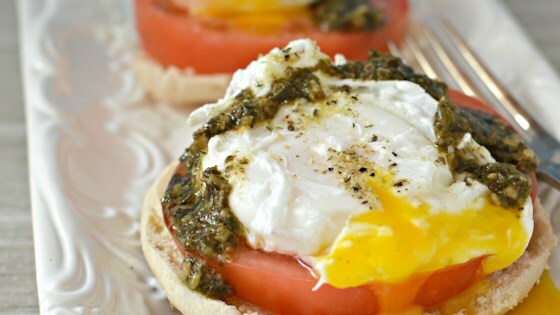 Poached is my favorite way of eating an egg so I was all about this recipe. As much as I love eggs benedict, this was a delicious change, not to mention healthier too. Thanks so much Yogin!